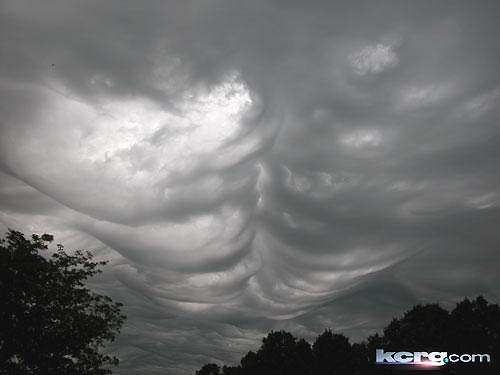 June 26, 2006 Cedar Rapids, Iowa – These photographs were taken by various Cedar Rapids, Iowa, residents on June 20, 2006, who were fascinated by the weird clouds that emerged around 9:30 a.m. Central time. 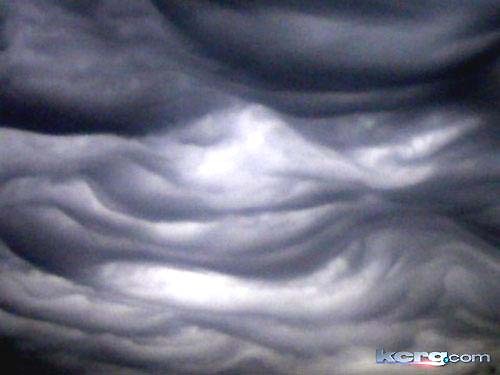 KCRG-TV reported the strange clouds were visible from Waterloo to southern areas of Iowa. Even more strange, there were no tornadoes or rain from the weird clouds. 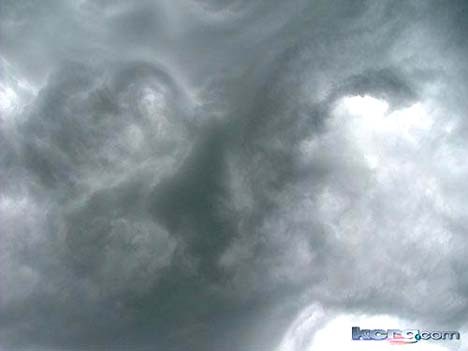 Bizarre swirling clouds at 9:45 a.m., June 20, 2006, in Cedar Rapids, Iowa. 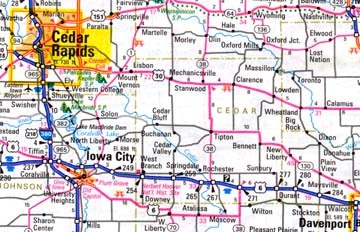 Image © 2006 by Wayne Adair and KCRG.com. “I thought I was going to see alien spaceships come down through the clouds,” Casey Dunagan told KCRG-TV (ABC). Others said it looked like a scene from the movie Independence Day. “I was sound asleep and my sister ran in and woke me up and said you have to come out and see these clouds!” Julie Hornickel said. Very low, double row of ominous-looking clouds in the morning of June 20, 2006, over Cedar Rapids, Iowa. Image © 2006 by Melikssa L. Looney, outside Sacred Heart Convent. 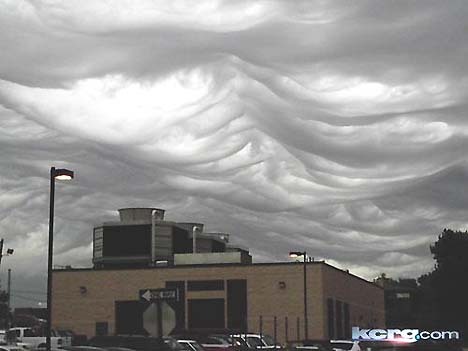 9:30 a.m., Central, June 20, 2006, cloud “low awnings” hung over KCRG-TV station, Cedar Rapids, Iowa. Image looking northeast from Physician’s Clinic of Iowa © 2006 by Kimberly Rehn and KCRG.com. Next PostNext Half Cats in Destin, Florida, and Beheaded Animals in Rochester, N. Y.